Character: brewed with fresh pumpkin and fall spices and has been aging in Oak barrels for 6 months. Uinta Brewing Company made its way here to TX! I had heard about this brewery through various websites, and was happy to see these guys on shelves here in San Antonio. I have only seen there 750 ml sized bottles from their Crooked Line Series, but what a way to start us off with these guys. These are all high ABV beers. Thanks beer distributors! 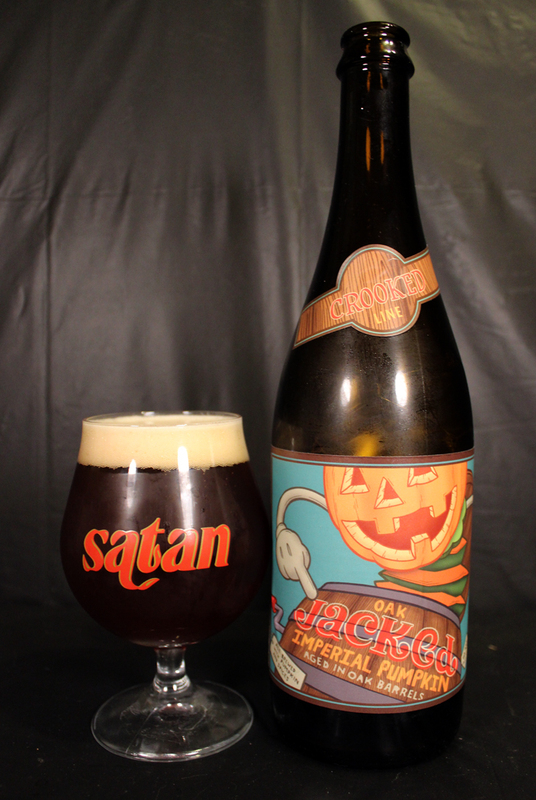 Oak Jacked Imperial Pumpkin Ale is my first bottle to have from Uinta, and what better time to have this but on a San Antonio version of a cold night in November. When I purchased this bottle, I was won over in so many ways. Firstly, the stunning eye-catching artwork on the label is very nice and colorful. Secondly, I see the words “Aged in Oak Barrels” on the label. Lastly, I see that the ABV is at 10.31%, which I heard is their clever play on the date of Halloween. I see what you did there Uinta! Using a Satan snifter glass, this beer pours a nice looking dark amber color with hints of red shining through in the right light. Once the chill haze on my glass cleared, this beer just looked amazing. it was topped off by a thick frothy cream colored head, which retained very well, leaving a sticky sheet of lacing down the glass. Even after letting the beer sit for a while to warm up, the head remained a thin layer atop the beer. The aroma of good Oak Jacked, I also give two thumbs up. It is a bit complex, as hints of a lot of characters come through my nose. At first I am hit with a pumpkin puree smell, and the usual spices like nutmeg, and cinnamon. Then my nose gets all weird on me. I pick up a faint clove scent, some vanilla, some wood-like aroma from the oak barrel, and then a stinging alcohol booze at the end. The aroma just makes me want to dive right in. The taste is also a treat, as all the characters in the aroma come out to play. I get a vanilla, woody upfront flavor, backed up by the pumpkin and spices. As the beer warms up, the booze shows up a bit more than at the beginning when first poured. As the booze lingers in the throat after the drink, the aftertaste is clove-like, even, dare I say, a raisin flavor. This is a medium-to-full bodied beer with a creamy mouthfeel. This has Good, gentle carbonation as well. Overall, I will say that I really enjoyed this beer enough to put it close to the top of my pumpkin beer list. Pumpkin ales are so hit or miss with me, since a lot of them seem to have a lot of similarities. I liked this one cause it added some differences that were refreshing. Considering this beer has a high ABV%, and it is near a heavy beer, I found myself able to drink a glass rather quickly, after I took my notes. Metal Connection: Pumpkin beers being out this time of year always make me think of Halloween. Uinta Brewing Co. also thought of Halloween, as they say the ABV on this beer is 10.31%. I found a Heavy Metal band from Detroit aptly named Halloween. Here is a music video for a song called “Trick or Treat” from their debut full length album, Don’t Metal with Evil, released back in 1985. The video is a bit cheesy, but it is definitely a treat to watch. It’s good to laugh every now and then. One of my favorite pumpkin beers.. cheers man!